All WMS 40 Mini series components share the same brilliant sound and ease of use at an unbeatable price/performance ratio. Unique HDAP (High Definition Audio Performance) technology ensures the best possible, most realistic sound at any time. 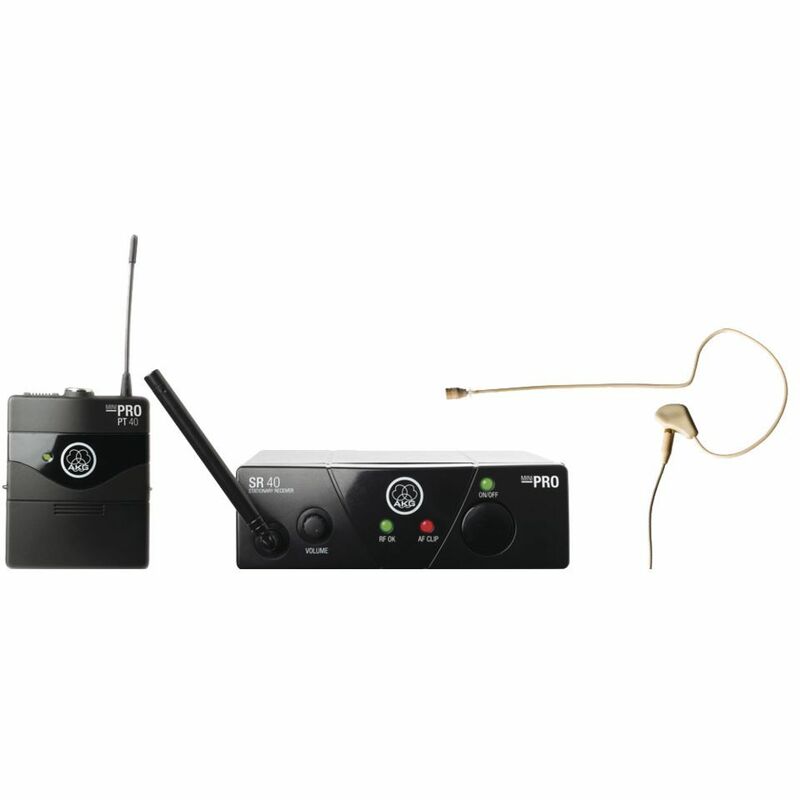 The SR 40 Mini receiver provides three status LEDs indicating ON/OFF status, received signal strength (RF OK), and audio clipping (AF CLIP). The VOLUME control sets the level at the ¼" output jack. Each receiver comes with a universal 12-V switched mode power supply with EU, UK, and US adapters. The PT 40 Mini bodypack is probably the smallest and lightest transmitter in its class. A reliable mini XLR input allows you to connect every compatible AKG miniature microphone. A single AA size battery will power both the transmitter and a condenser microphone connected to it. Battery life for each WMS 40 Mini transmitter is the same legendary 30 hours off a single AA battery as for the standard WMS 40 models, reducing the need to replace batteries and thus saving real money in the long run. I was really pleased with this headset microphone. I already had the twin handheld pack and wanted the headset to make my job a little easier - and it does! It is so small that no one can see it and it came with a lead to plug into my electric guitar as well! It arrived very quickly after ordering it and as I said before, I am really pleased with it.